Peter Edelman, Chairman of the D.C. Access to Justice Commission, and Jim Sandman, President of the Legal Services Corporation – two visionaries in the access to justice movement – beamed as they looked across a room filled with nearly 80 committed pro bono volunteers and supporters at the Housing Right to Counsel Celebration Breakfast hosted by Steptoe & Johnson LLP last week. Several years ago, Peter and Jim approached about a dozen managing partners from major law firms with a bold request: to join an ambitious initiative aimed at tackling D.C.’s housing crisis. A key component of the initiative was an experiment to make a civil right to counsel a reality for low-income tenants with housing subsidies who are facing eviction proceedings. The Housing Right to Counsel Project was launched in 2015 with the goal of dramatically increasing access to counsel for tenants with housing subsidies who are facing eviction. The Project addresses the overwhelming imbalance of power in the Landlord and Tenant Branch of D.C. Superior Court, where about 90% of landlords are represented, while 90-95% of tenants are unrepresented and face the possibility of eviction. Legal Aid, Bread for the City, Legal Counsel for the Elderly, and the D.C. Bar Pro Bono Center have partnered with 14 major law firms and the Federal Government Pro Bono Program to carry out the mission of the Project. Legal Aid’s Beth Mellen Harrison, who was recently awarded the prestigious national Housing Justice Award, is the Director of the Project. The Housing Right to Counsel Project has been impactful on multiple levels. Legal services and pro bono attorneys have helped hundreds of tenants remain in their homes by representing them through this Project. The data shows that tenants represented through the Project are seven times less likely to face an imminent threat of eviction compared to other tenants (most of whom are unrepresented), demonstrating the unequivocal improvement in outcomes for tenants who are represented. The Project’s success has caught the attention of key stakeholders and contributed to the D.C. Council’s recent allotment of significant city funding for purposes of eviction defense. The Project underscores the power of collaboration between the legal services community and the private bar to take on an access to justice issue. 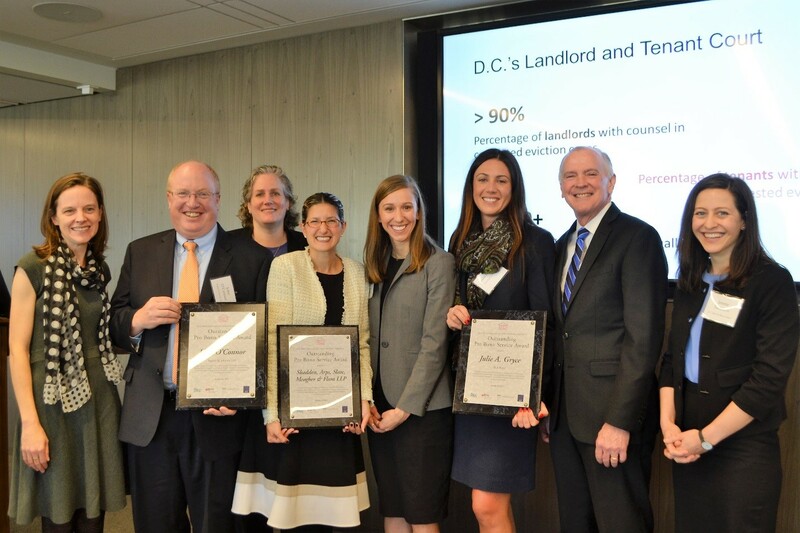 The Celebration Breakfast highlighted these exciting developments and honored Skadden Arps, John O’Connor of Steptoe, and Julie Gryce of DLA Piper with Outstanding Pro Bono Service Awards for their stellar participation in the Project. The law firm of Skadden, Arps, Slate, Meagher & Flom LLP received an Outstanding Pro Bono Service Award for its sustained commitment to the Project. Skadden associate Daniele Schiffman, who, along with two other associates, handles eviction cases and coordinates the firm’s participation in the Project, accepted the award on behalf of the firm. Daniele spoke passionately about the Project’s impact and the trail-blazing housing practice group that Skadden has created. 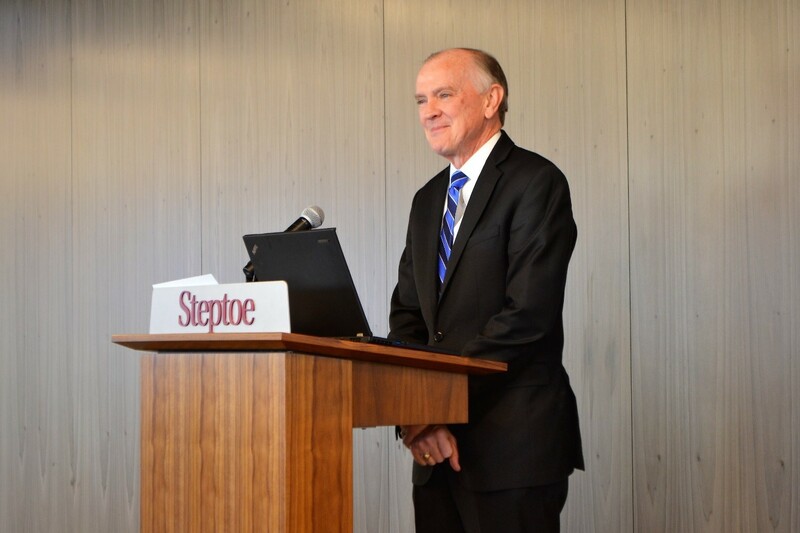 Steptoe partner John O’Connor received an Outstanding Pro Bono Service Award for taking the lead on developing a successful model for the Project internally at his firm and for providing critical representation that has helped a number of tenants avoid eviction. 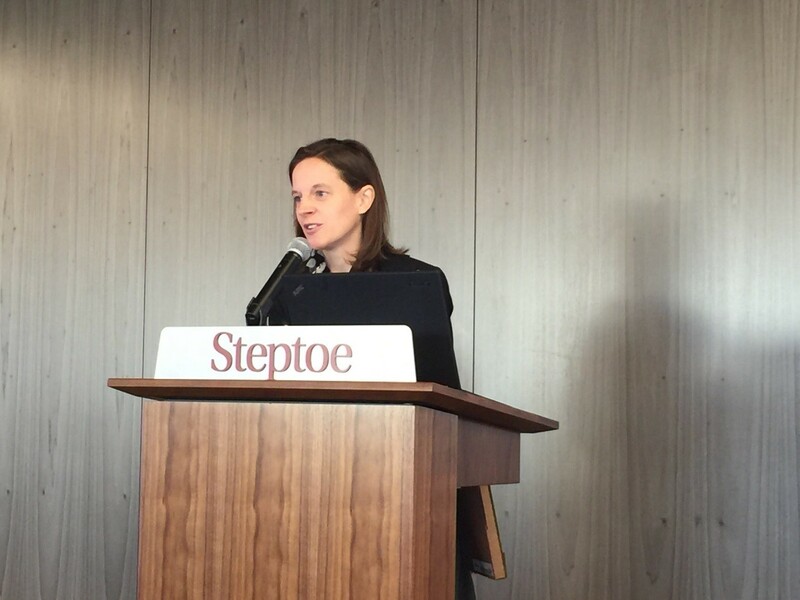 Julie Gryce, an associate at DLA Piper, also was recognized with an Outstanding Pro Bono Service Award for her fierce and inspirational advocacy on behalf of tenants she has served through the Project. Upon accepting the award, Julie urged her peers to not just take a case but to keep taking cases. As John O’Connor astutely pointed out during his remarks, for a low-income tenant facing eviction proceedings, his or her case is not just a small part of a bigger systemic problem or the “big picture.” Rather, for them and their families, it is the “whole picture.” Losing that case could have devastating consequences, including long-term homelessness. Focusing on the “smaller picture” is crucial to helping a family avoid an unnecessary eviction. We applaud John, Julie, Daniele, and the many other pro bono attorneys who have joined this citywide initiative to battle injustice.